Last week we talked about our jaw dropping reaction when we first saw pictures of the two historic houses in Little Rock and were contacted about our interest in salvaging them. We knew we had to come to the rescue of the antique artifacts that lay within, the most impressive being the seven unbelievable mantels and the figural tile sets they encased. In our 44 years of business we have rarely seen a tile collection housed under one roof the likes of these. Each of the seven fireplaces framed beautiful glazed tile, many showcasing incredible figural tiles from the American Encaustic Tiling Company dating back to the 1890’s. Most of the figural tiles were sold on location to local residents, many of whom have a keen interest in preserving a piece of their city’s history. We do however want to share a few pictures, as well as a bit of history surrounding these tiles, in an effort to create an awareness of the antique artifacts that are needlessly lost when property owners demolish old structures without allowing salvage companies, like Southern Accents, the opportunity to rescue objects of historical significance. These magnificent tiles came from the American Encaustic Tiling Co. (A.E.T.) in Zanesville, Ohio. At one time this company was reported to be the largest tile manufactory in the world. Founded in 1875, the company produced a wide variety of wall and floor tiles as well as very decorative art tiles. By 1890 there was a need to expand the rapidly growing company. A new plant was built in Zanesville, Ohio and dedicated on April 19, 1892. The celebration was attended by 20,000 people, arriving by foot, train, boat and horse-drawn carriage. The company remained a boom to the Zanesville community for the next 40 years, closing in 1935, being a victim of the Great Depression. During this time, A.E.T. had a major presence in New York City, not just as a producer of floor and wall tiles, but also as a creator of art tiles and tiles used in architecture. Leon V. Solon became the artistic director of the company and created impressive showrooms at the 41st street location in Manhattan around 1912. In the 1920’s, Solon re-designed the A.E.T. showrooms, making them a “virtual tile museum”. Preservationists were unsuccessful in their attempts to landmark the building in 1993. Most, if not all, of the tiled interior has been demolished by tenants and landlords over the previous years. This image is the American Encaustic Tiling Co. stamp located on the back of several of the figural tiles. Stamps and what we call “maker’s marks” are paramount in helping us track the history of antique artifacts. We view these colorful, glazed pieces of earthenware as incredible works of art. We feel privileged to be given the opportunity to save these works for future generations to appreciate and enjoy. In our continuing mission to promote the preservation of our architectural heritage through rescuing, restoring, and protecting artifacts of historical significance, we are thrilled to be able to share our mission with you each week through pictures and stories via our newsletter. 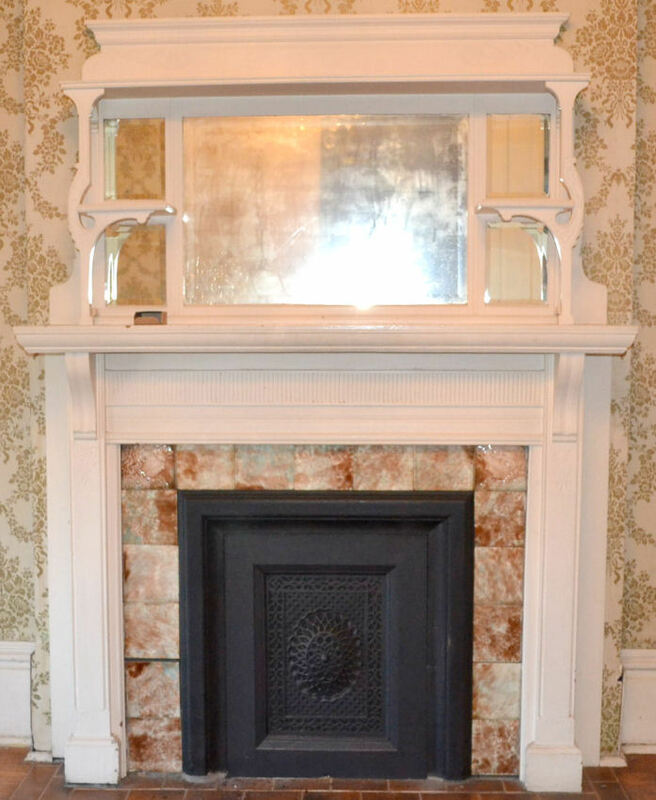 The first image above shows one of the seven tile sets and surrounding mantel before it was removed from the historical 1890 Bruner house in Little Rock, Arkansas. This set is available for purchase. Click Here for details. 3 Generations – Tripp On His First Salvage Trip! 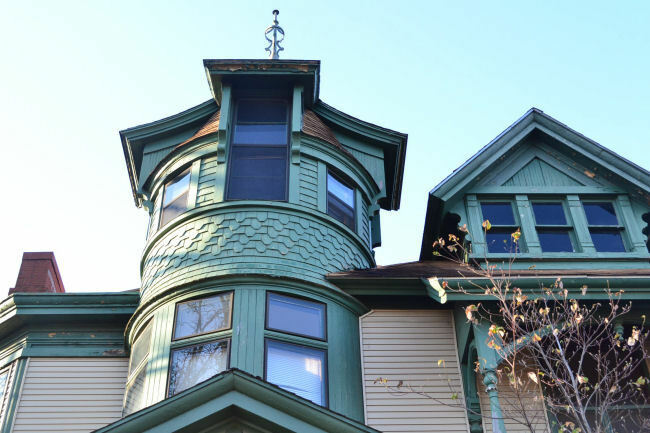 One of our primary goals at Southern Accents is to preserve the stories of the architectural elements we obtain. Having a family owned and operated business for 54 years means that we have a treasure trove of personal stories to tell as well. 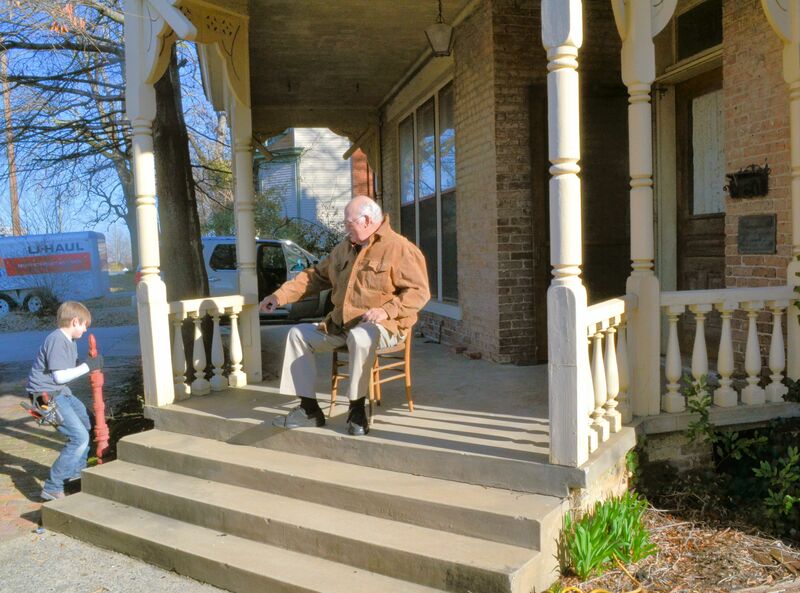 Dr. Gudger started this business in 1969 when his love for collecting architectural antiques quickly filled up his garage and he decided to take his hobby to the next level, turning it into a small business. 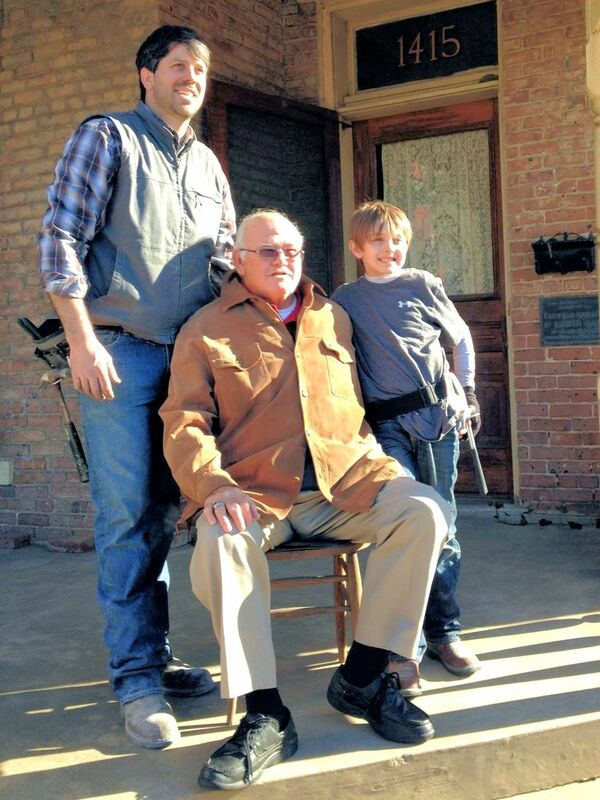 54 years later his son, Garlan, Jr. now manages the business and is passing his love for preserving the past to his two sons, Garlan III (Tripp) and Pierce. Dr. Gudger mentoring Tripp on his first salvage mission. This post which Tripp removed will remain a family keepsake. If you have been following our posts these past two week’s you already know that we have been salvaging two houses in Arkansas, one of which is on the national register. Even though salvaging these houses is a double edged sword for our family, we are thankful that the owners gave us the opportunity for such a significant find. Three generations of the Gudger family traveled together for Phase I of the salvage operation; Dr. Gudger, Garlan Jr. and for the first time Garlan III (Tripp). 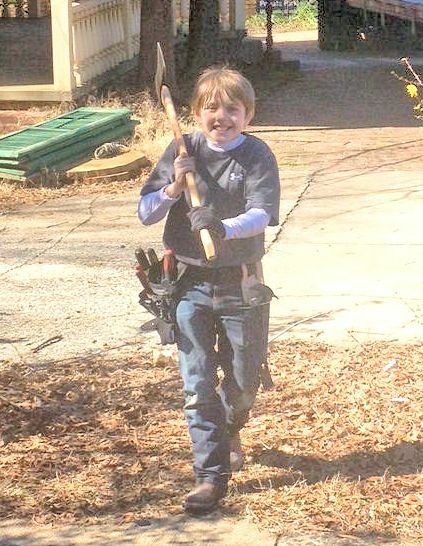 Tripp’s first salvage job saw his Grandfather watching over and mentoring him… all the while encouraging that same passion for architectural salvage that he instilled in his own son Garlan Jr. years ago. Tripp has started asking questions and showing an interest in the business that Garlan Jr. is hoping to foster in both his sons. There just might be a few floor sweeping days for the young Gudger boys in the very near future! Tripp Gudger on his first salvage mission! If you have been following our blog, Facebook posts or newsletter, you already know that this past week found us very busy with a sizeable salvage project in Arkansas. We were questioned numerous times on site in Little Rock as to why we were taking apart these beautiful historical homes. Our primary mission has always been: “To promote the preservation of our architectural heritage through rescuing, restoring, and protecting artifacts of historical significance.” We have always prided ourselves in never taking historical fabric from a structure that has not already been scheduled for demolition. There is nothing more enjoyable to us than seeing historical structures renovated and brought back to life. But we all have watched in horror as buildings have been crumbled and reduced to rubble by a wrecking ball, taking with it recyclable material and, at times, beautiful, irreplaceable architectural pieces that could have been rescued. When a historic building or structure has been scheduled for demolition, for whatever reason, Southern Accents is the company that you want to see on the scene ahead of the bulldozers. 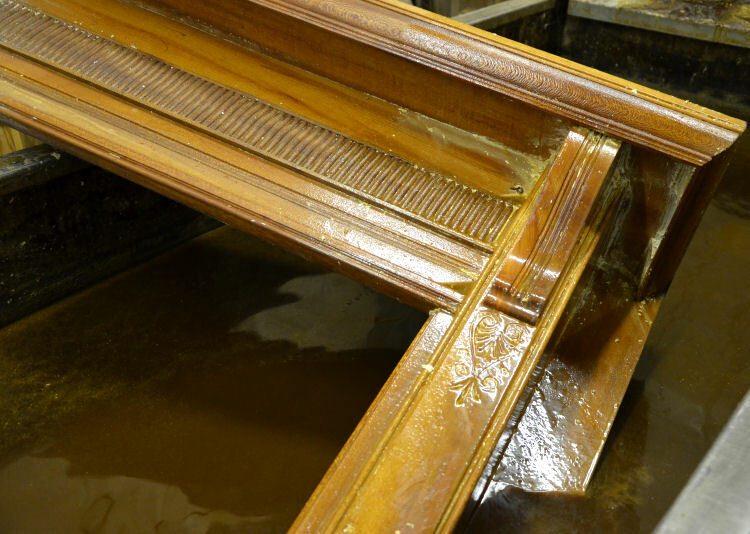 The purpose behind our recent salvage job in Little Rock Arkansas, and every structure that we have gone into over the past 54 years, is so that we can rescue and restore the artistry of the architectural pieces we are able to obtain. 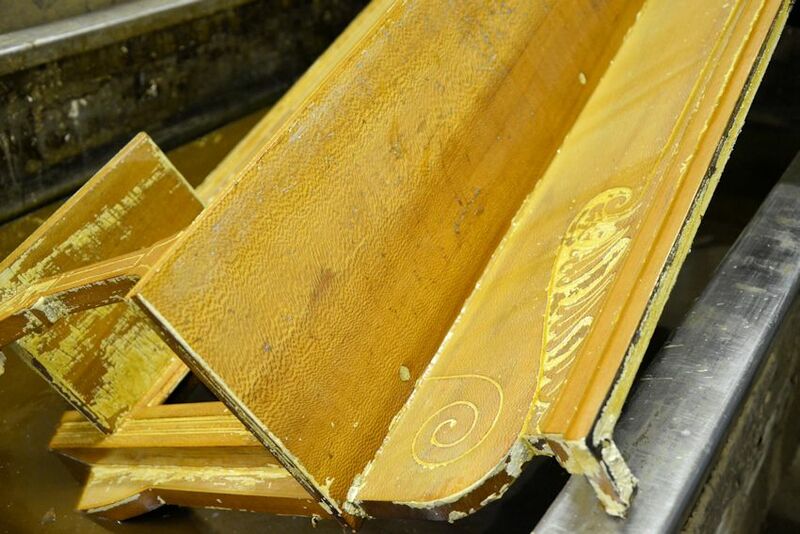 By restoring these fragments, the history and craftsmanship are protected for many more years to come. What we do is nothing short of an architectural rescue mission… We save old stuff! 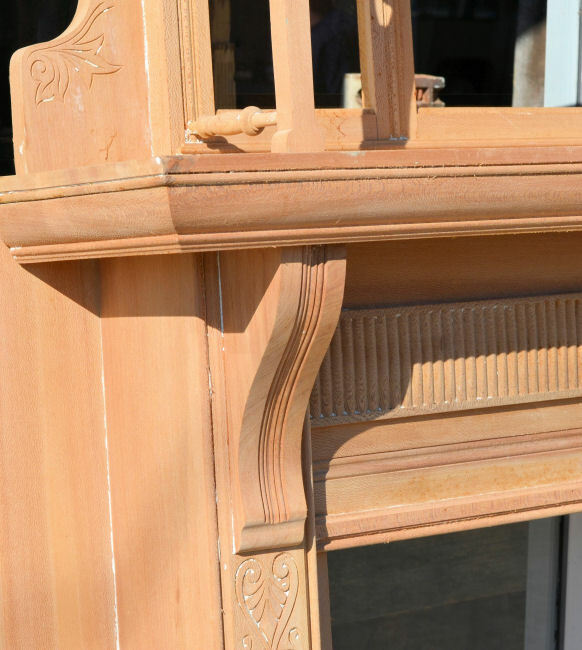 Much of the architectural salvage pieces that we call “building art” is hand crafted and/or hand carved. We value these pieces as treasured works of art. Most items would be hard to replicate or even impossible to reproduce because of cost, time and lack of craftsmanship. We parallel the intent of purposely destroying these architectural pieces as being equivalent to the destruction of a prized historical painting. By helping protect these building arts, we believe that Southern Accents is at the forefront of historical preservation by salvaging and recycling as much as possible before the wrecking ball arrives. If given enough time, we try to save everything we can right down to the wall studs, rafters, exterior siding, and brick as well as any architectural component that has any character or integrity in the interior. Everyone should realize that the SUM of the individual pieces, taken out of a structure during a salvage job, will never equal the TOTAL of the architectural splendor when it was placed together in its entirety. Knowing that fact, it is our goal to salvage the historical, artistic, hand-crafted relics of architecture from each structure thus allowing the story of each home or building we tear down to live on for generations. We love it when people walk through our showroom and we are able to give them the history of an architectural relic. When we tell the story of a particular item, we know, that in a small way, we had a hand in preserving and documenting the history and story of where that item came from for future generations. We take pride in the accomplishments we have been able to make these past 54 years of business and look forward to continuing our mission of rescuing, restoring, and protecting for years to come. Being passionate about historical preservation, it disheartens our soul to see a beautiful old home or property reduced to rubble. Whether it is the result of urban sprawl, neglect or natural disaster is irrelevant… in our book it is still a sad passing. However, we do find fulfillment in being able to salvage pieces of historical significance before the wrecking ball turns it in to rubble. Although it is never our purpose to demolish any property, we consider it an honor every time we are afforded an opportunity to salvage an old structure that has been scheduled for demolition. 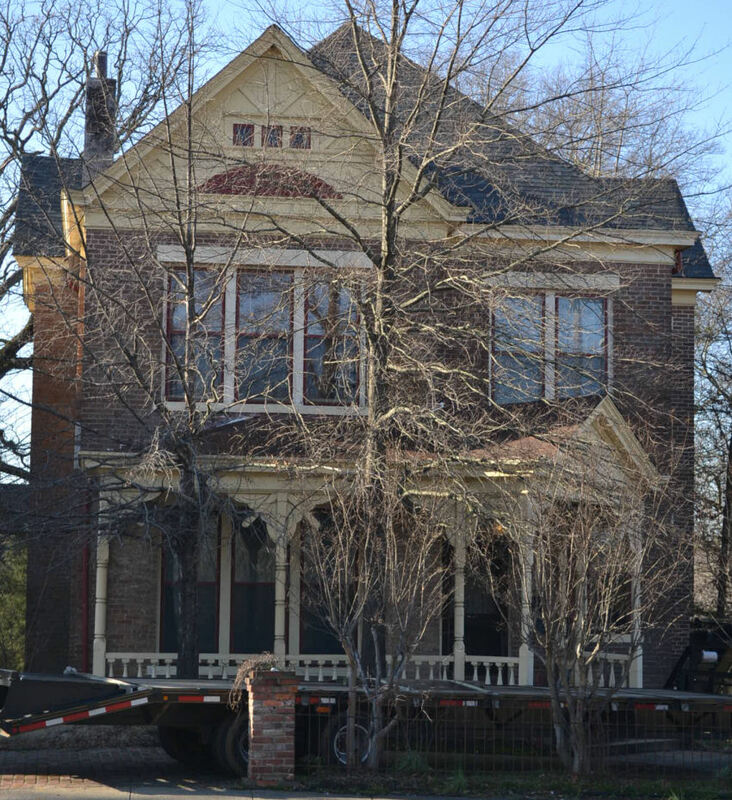 This week we traveled to Arkansas for a salvage project involving two 1890 Victorian houses. 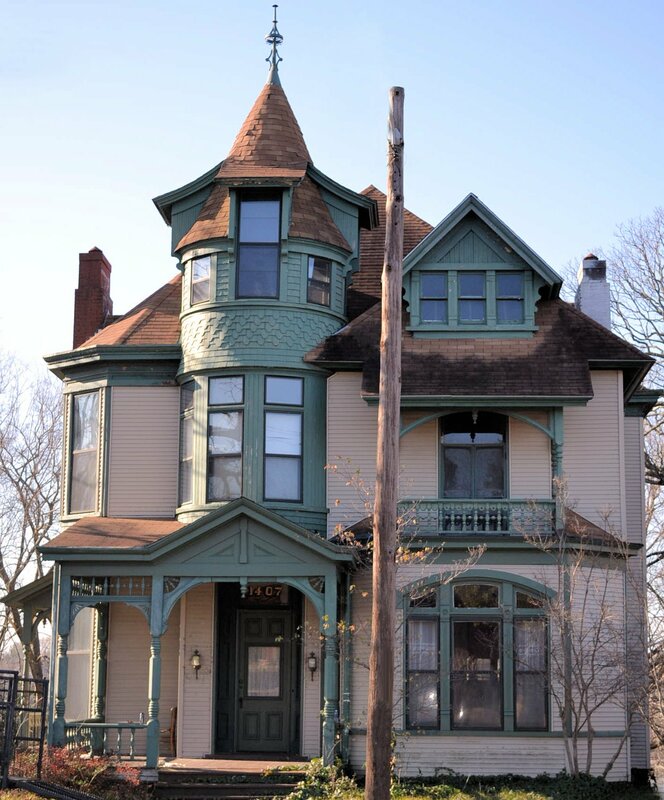 These beautiful old houses have been sitting on private property that was recently sold. Both houses are scheduled to be taken down to make room for a private school. When contacted about our interest in the structures, we were thrilled to come to the rescue of the beautiful architectural pieces contained within. This is one of our largest salvage projects to date and several trips will be required to complete this project. 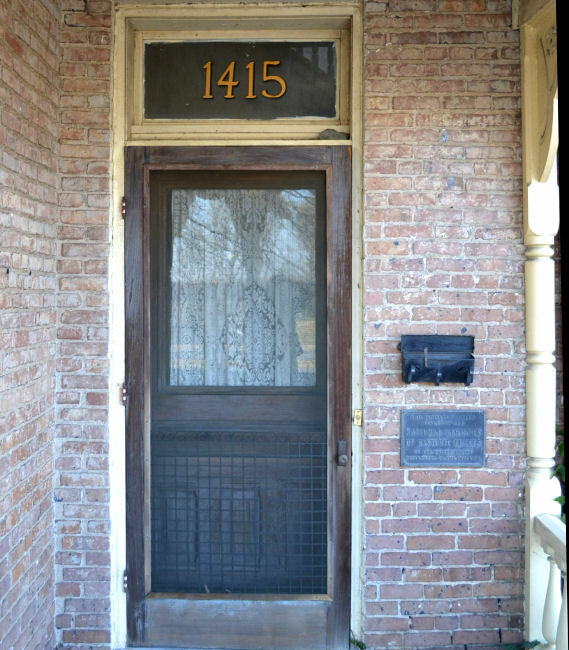 Phase I saw us returning with beautiful solid wood paneled doors, carved fireplace mantels, Eastlake Victorian cast brass door hardware, antique lighting, fencing, gorgeous fireplace tile sets, claw foot tubs and much more. Some of the large architectural pieces have already pre sold to interested buyers on site. We will be posting all available pieces to our website and Facebook account as soon as we are able to unload, process and picture each item. Southern Accents is returning to these historical structures for Phase II in March to continue to salvage and recycle as much material as we can possibly rescue. The architectural pieces that will be lovingly restored, only serve as a reminder for the new owners of what once was, and will be part of a new story for the next generation. They will provide future memories as they might someday be seen in family photos yet to be taken. Other salvaged artifacts could be re-purposed into other useful items and creative projects. Playing a role in the challenge of transitioning these historical artifacts is a measurable task and is one of the reasons we are so passionate in doing what we do! Please keep a close watch on our New Arrivals page as items and artifacts from this project will be posted here. If you are looking for particular items and are interested in pre sales for the many pieces that we will be bringing back, please contact our showroom at 877 737-0554. We also invite you to browse our other blog posts about this project. You can read a bit of history on the houses and view pictures from the interior of both. Make sure you follow our blog as we will have more interesting stories to share about this project.